If you have a sparking microwave this repair guide can help. Microwaves will sometimes spark but it doesn’t necessarily mean it is time to throw them away. Sometimes it is a very inexpensive and simple repair. But of course this is not always the case, sometimes a sparking microwave is sign of a major problem. In any case, this page will help. When microwaves spark most people panic. There is nothing to panic about, simply turn it off until further inspection can be done. First off anything metal will cause a microwave to spark so be sure that nothing metal is in the microwave. This could be a very small piece of metal. For example, maybe you cleaned the microwave with steel wool and left behind some metal from the steel wool. This could be enough to cause a microwave to spark. Also make sure the container you were using to heat with is microwave safe. Some things may look microwave safe but contain metal, which can cause a spark. If there wasn’t any metal in the microwave the next thing you should do is find out where the spark is coming from. Place a cup of water in the microwave, turn it on and watch to see where the spark is coming from. Below is a list of things that will cause a microwave to spark. Some microwaves have shelves and what sometimes happens is that the shelf support will heat up and become loose. This will cause a microwave to spark. This is a very simple repair simply pull the shelf support out and replace it with a new one. 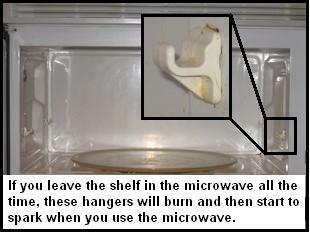 To prevent this only use the shelf if you are cooking two things at once, otherwise keep the shelf out of the microwave. AppliancePartsPros.com. The microwave turntable lug is the plastic lug that turns the turntable. Sometimes this lug will cause a sparking microwave. To repair it simply remove the lug by prizing up on it and then replace it. AppliancePartsPros.com. That is all for the simple sparking microwave repairs now for the more complicated repairs. If you are going to attempt to replace the magnetron you tube you will have to come in contact with the high voltage section of the microwave. Before doing so read this warning. Microwave repair can be dangerous! You must unplug the microwave before attempting to repair it because they use very high voltage on certain internal parts. After the microwave is unplugged you must also discharge the capacitor before servicing because the high voltage that the microwave operates on is stored in the capacitor. 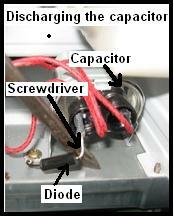 To manually discharge the capacitor, place an insulted handle screwdriver between the diode connection of the capacitor and ground. It should discharge itself but always discharge it manually!